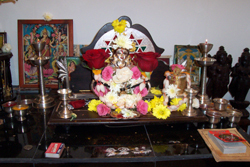 Mangala Gowri Puja is dedicated to Goddess Gouri also known as Goddess Parvathi. 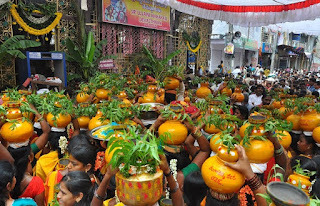 They will offer puja to Lord Ganesh before performing Gowri puja. Newly married women observe Mangala Gowri Puja in the first five years of their marriage in Srvana month on Tuesdays. Tuesdays in the shravana month are also known as Shravana Maasa Mangalvar. Special pujas dedicated to Goddess Gowri is performed on the day and women dress up like a traditional married woman with all bangles and flowers symbolically indicating to Goddess Gowri that they want to be like this on all days. The method of puja and mantras used vary from region to region.